In front of you is Italian armet - one of the most interesting and versatile middle ages helmet adorning the rich collection of the Metropolitan Museum in New York. This helmet reached us, having lost his visor and rondel in the darkness of the ages, but we recreated them with the visor and rondel of his brother Armet, who also posing in the Metropolitan Museum. This armet is a part of The Avant Armour, one of the oldest near-complete armors in the world. It is dating about 1450-1485, was crafted in Corio workshop, Milano, and was belong to Fon Matsch, the owner of Churburg Castle in 1450 and you can see him in Kelvingrove Art Gallery and Museum, Glazgo, Scotland. Armet was the typical medieval knight helmet of the fully armored equestrian knight throughout most of the XV century. 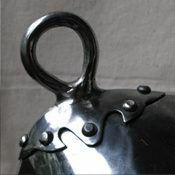 Its smooth, compact, rounded form typifies the streamlined appearance of XV century Italian armor in general. Armet helmet has unusual and ingenious to his time construction, with cheeckpieces hinged to the bowl that opened to admit the head. Most armets (except early) were equipped with protection of the neck and collarbone. 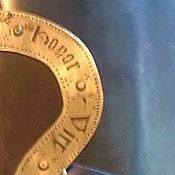 A few more words about rondel - circular piece of metal used to defend the back of the neck. Truth that we still don’t know exactly why armets firstly appeared without them, then developed at many shapes and styles, and then rondels mystically disappeared a few decades later. As an option, you can order solid hammered dome and visor, mail aventail, another type and thickness of metal, color of strap, finish treatment and decoration. It will be easier for you just to buy Milan style full plate Avant Armour, at last ;) In addition, we recommend put it on padded chausses and gambeson. In section Full armour you can see all models that we offer.  If you didn’t find any for your taste and wish, please send us photo and description and we will make it for you. Bascinet Hounskull (or Hundsgugel) is a type of medieval head protection, which was widespread in the XIV among knights of all social classes. Helmet with extended visor “Hounskull” looked like a dog muzzle, so it got such name. Visor could be attached to the dome with hinge on the forehead part (so-called “klappvisor”) or with one or two hinges on the sides. Numerous holes on visor and eye slits provide with perfect ventilation and vision. Our version of battle basinet is decorated with cross on the cheek. For better protection, such functional head armor was often completed with mail aventail. 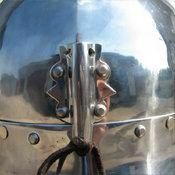 You can use this medieval head protection for: SCA HEMA Larp Stage performances Medieval festivals Reenactment events Main photo shows custom battle helm with following options: Cold-rolled steel 1.5 mm; Mirror polishing as finish treatment; Steel rivets; Brown leather and steel vervelles for aventail; Visor back fixation with knot; Attaching of visor with two side hinges; Decorative brass strips; ..
Steel bracers are made of normal steel 1.0 mm. They are good alternative to leather bracers and perfect addition to full LARP-armour. 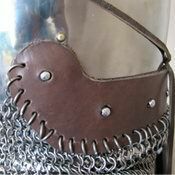 Bracers are fixed on the arm with leather belts with steel buckles. Please choose the wished type of metal in options. ..